As promised, here are the appetizers I made for my New Years Eve party. I’m pretty sure my guests liked them, seeing how they ate up every bit of these three dishes. Here they are in the order they were eaten the fastest. Oil a pizza stone or large baking sheet with the first two teaspoons of olive oil. Put dough in the middle of the pan or stone and use fingers to press out the edge or rim. Heat oven to 400 degrees Fahrenheit and cook dough for 15 minutes. Meanwhile, heat the other teaspoon of olive oil in a small skillet or pan. Add shallots and cook until shallots begin to brown. Sliced Brie thinly (I leave the rind) and distribute evenly all over the dough. Top evenly with pear slices and shallots. Turn on broiler and increase heat to 500 degrees Fahrenheit. Broil flatbread 2-3 minutes or until cheese is completely belted. Cut into 3 inch squares or triangles and serve. I might have mentioned this before, but this recipe is money. I can’t tell you how many people asked me what was in it as they scarfed it down. You can always buy a pre-made cheese ball at the grocery store. But it won’t have nothin’ on this! Slice or shred cheddar cheese and melt in a microwave or small pot on the stove. Stir in cream cheese and crumble Roquefort cheese into the cheese mixture, stirring well. Add onions, salt, and about 1 1/4 cup of the pecan. Spoon cheese mixture into a cereal bowl, rounding the top with your spoon. Cover with plastic wrap. Refrigerate for at least an hour. Remove plastic wrap and turn bowl upside down on a plate or serving platter. 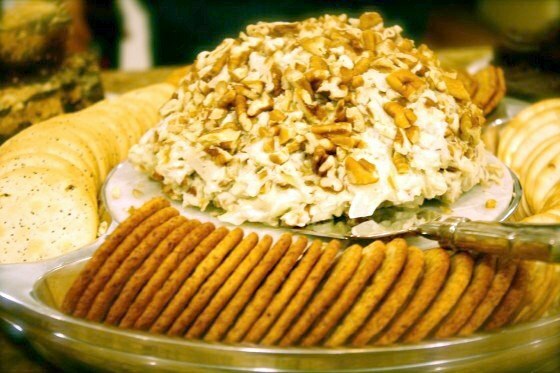 Take the remainder of the chopped pecans and press along the outside of the cheese ball, distributing evenly all over the ball. In a medium sized mixing bowl, combine pesto, ricotta, and salt. Add sundried tomatoes and stir. Put flatbread back into the hot oven and cook for 3-5 minutes or turn oven off and allow flatbread to warm until your guests arrive. 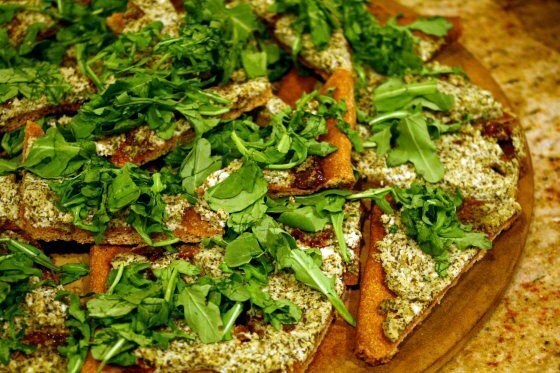 Remove flatbread from oven, slice into 3 inch long squares or traingles and sprinkle with arugula. Here are some time saving tips you can use for these recipes to make the day of the party go more smoothly. Slice pears, onion, cheese, shallots, and sun-dried tomatoes the night before. Add a bit of lemon juice to the pears to keep them from browning. Saute the shallots and put in a sealed container to quickly add to the flat bread, just before cooking. Set out the pizza dough and allow to cook to room temperature. This makes it easier to press out onto your pan or stone. 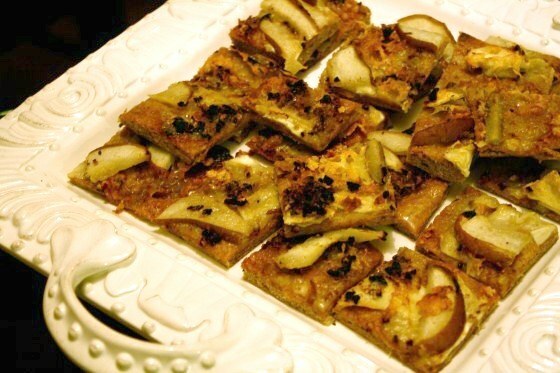 If you’re looking for more meatless or just plain yummy ideas for a party, check out my post on vegan hors d’oeuvres. Cheeseball will always have a special place in my heart. I can’t believe I waited this long to make one. It was so easy and sooo much better than pre-made balls. Both flatbreads look fab! So does the cheeseball but I don’t do much cheese for digestive reasons ;P Great way of breaking tasks up from a week out! Wow, these all sound amazing. Love the pear and Brie combo. Also, I have a huge love affair with Pesto. Thanks for sharing!